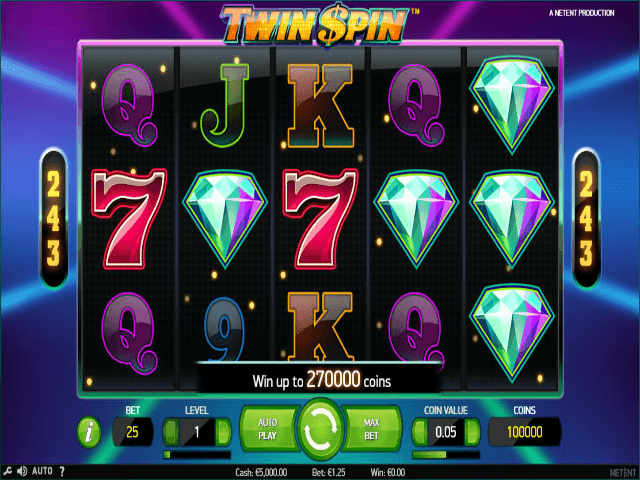 If you like the straightforward nature of traditional style slot features yet have a hankering for modern, mould-breaking games then Twin Spin could be the very slot for you. 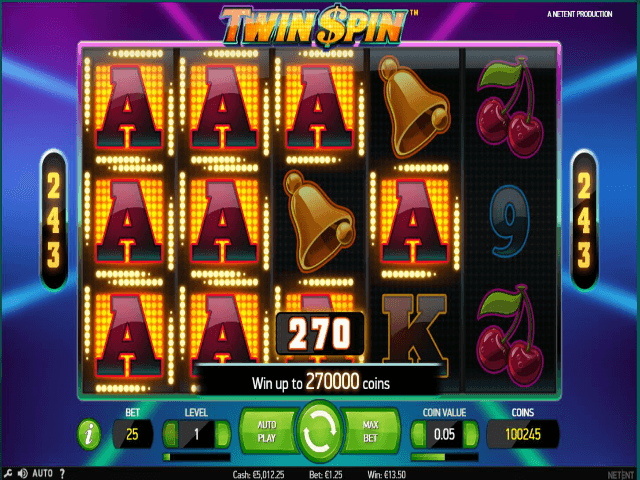 Stacked with traditional slot machine technology along side cutting edge features and captivating graphics, the Twin Spin online slot finds itself among the most sought-after slot games on the internet thanks to its unique combination of the best from both the past and present. Why are so many spinners racing to play to Twin Spin? Read on to find out! The real beauty of this exciting and somewhat rarefied offering from NetEnt is that it operates a policy of spinning two adjacent twin reels together, thereby ensuring at least two of the game’s five reels are cloned (i.e. offering the same symbol). Moreover, this feature can even be expanded to become triplet, quadruplet or quintuplet reels. Suffice to say, this increases your chances of winning considerably. Looks-wise the Twin Spin slot game has gone for a less-is-more approach with a slight 70s retro vibe thrown in for good measure. Essentially we’re talking about unfussy visuals with clean lines, and colourful old-school symbols that are reassuringly big and bold. The groovy mild-funk soundtrack is foot-tappingly pleasant, too. Think Starsky & Hutch crossed with a montage from Boogie Nights and you won’t be too far wrong. This five-reel, 243-payline offering can be played for as little as 25p per spin. The maximum you’re allowed to bet is £125. In addition, Twin Spin is considered a medium-to-high-volatility slot machine so the house edge tends to hover around the 3.4 mark. 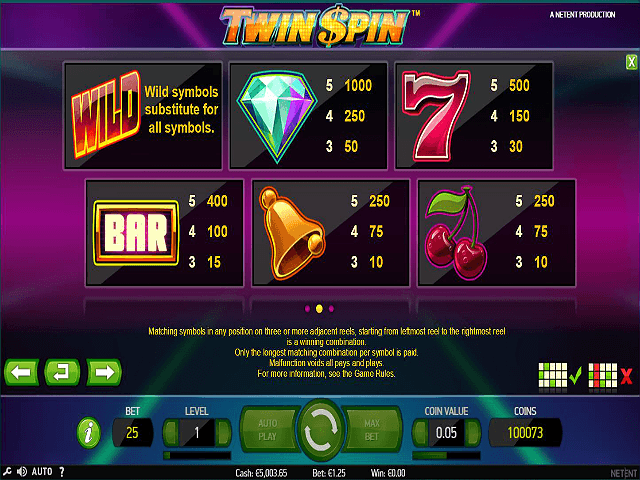 All of the symbols on display in the Twin Spin online slot resemble emblems you’d associate with a 1970s casino. So, apart from the 9, 10, J, Q, K and A you can expect to see cherries, bells, red sevens, bars, and diamonds whizzing around the reels. If five diamonds pop up on an active payline then you’ll land a 1,000 coin jackpot. Naturally, there’s also a wild symbol which acts as a replacement for every other symbol in the game. The wild can appear on any of the linked reels apart from the first one. Because it’s at heart a very straightforward slot, Twin Spin doesn’t boast dazzling extra features such as Free Spins, Stacked Wilds or Bonus Games. The Twin Reels feature is what truly sets this offering apart so this is where the onus of the game is focused. The fact that the reels on which the feature is activated are generated randomly, and that each spin is unique is more than enough to keep your brain suitably engaged. Knowing that these twin reels can expand randomly to become triplet, quadruplet or even quintuplet reels is, in many ways, a bonus game in itself as well. 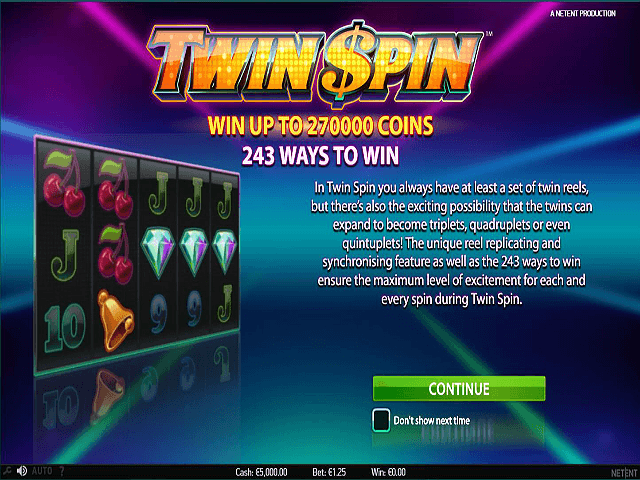 Whilst some experienced players may feel Twin Spin is perhaps a little too simple, it’s definitely the case that this engaging and highly accessible slot offers plenty in the way of immediate appeal. Of course, the addition of the twinned-reel feature is the main draw and there’s no doubt it keeps the excitement bubbling over nicely. The rather handsome 96.6% RTP is well worth getting out of bed for, too. 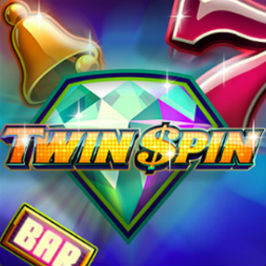 If you like Twin Spin - You'll like these slots too!